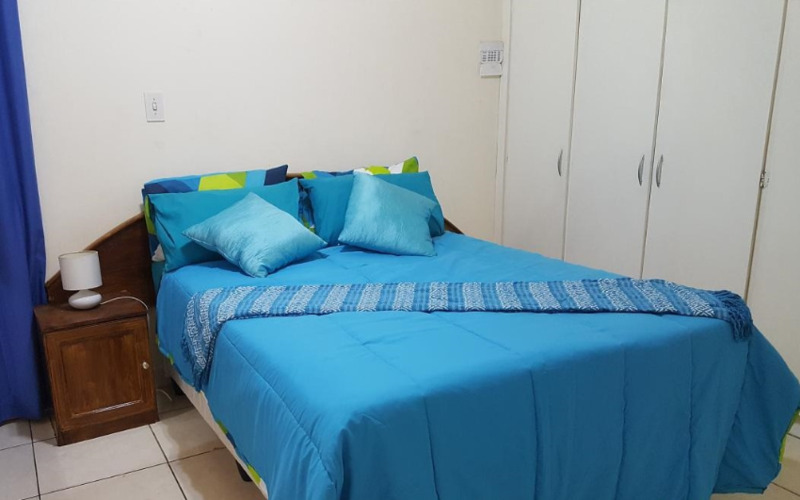 The unit has a private entrance and consists of 1 en-suite bedroom. The bedroom is furnished with a double bed and the en-suite bathroom features a shower. The open-plan kitchen contains a fridge-freezer, a 2-plate stove with a mini oven, and built-in cupboards. The lounge has a single sleeper couch for 1 child, and a TV for media entertainment. Limited free Wi-Fi Internet is available in the unit. The guest flat has an allocated parking space for 1 car. Indigo Guesthouse is also located 5 minutes from Ashley Saints Baseball Club, and 10 minutes from a shopping centre. The unit has a private entrance and consists of 1 en-suite bedroom. The bedroom is furnished with a double bed and the en-suite bathroom features a shower. The open-plan kitchen contains a fridge-freezer, a 2-plate stove with a mini oven, and built-in cupboards. The lounge has a single sleeper couch for 1 child, and a TV for media entertainment. Limited free Wi-Fi Internet is available in the unit. The guest flat has an allocated parking space for 1 car.